Yes.. I finally gave in and made a new Hunter. It’s not like my Mage is 87 now and could reach 90 in a rather short amount of time if I really levelled her properly.. But oh well. This game is not a chore, right? So if I feel like making another Hunter, then I will make another Hunter! I have to admit, after playing Mage for so long and not being completely happy with the Human Hunter I originally made on Argent Dawn (the animations of female humans are too stiff >_<) I was thinking about making another Night Elf again for a while, and now that I finally did it proves to be a good decision already – in more than one way. After all my very first character I ever made in World of Warcraft had that race and class combination before, so it has a rather nostalgic feeling to it. That was so long ago. ._. Going back to these roots now feels like pulling out the old favourite clothes from the wardrobe, taking off shoes after wearing them for too long, using the playground at night as an adult – just this familiar feeling of fun and easiness, of old happiness. It came somewhat as a surprise and I wasn’t prepared for the strong feeling of being comfortable and at home, but now it’s there and it’s pretty certain that this character will see some higher levels soon. So this is my newest goal now, finish getting my Mage to 90 and pulling the Hunter up as well (the latter is probably going to happen first, though ._.) before the next patch! I’m not that optimistic and have no clue if I can do it at all, but there’s only one way to find out. After all there is still a bit of time and Hunter is a class that’s very easy to level, especially since I had so many already and it’s no trouble to do group stuff alone. This kind of ruins the original plan of getting Teribeth to level 90 quickly and then start to farm reputation for all those factions of Pandaria to get all those rewards and the mounts left to collect for me. Saying that it’s not a race at all wouldn’t be completely true, since I would have wanted to do that before the patch to get started on some of the new content that’s going to be added. But then again, it’s not like I was ever great in keeping up with the actual content, even less in finishing raids and achievements related to them when they’re up to date, so it’s not exactly going to hurt my play style. Seems like that will keep to be my fate – forever a slowpoke! But at least I’m having a lot of fun with it still, after all this time. Even though I have to say the elvish starting areas were rather confusing, they kept a lot of the old storylines but still changed some points around it, which ended up with me going to the wrong places too soon and having to go back to finish a quest, and other problems with the orientation. I ended up climbing the big tree in Shadowglen before I was supposed to, and then there’s this thing with the Ban’ethil Barrow Den – I keep making the mistake of going back to the big ‘crossroads’ room to find the body of Oben Rageclaw for the quest Druid of the Claw, forgetting that they actually put him in a room right next to his ghost (and the quest giver) now. Seems like old knowledge doesn’t die easily, even though it’s completely wrong and out of date.. Not sure if that is actually a good or a bad thing. ._. Anyway! I guess those were enough meaningless words thrown together, maybe I’m just getting a bit too worked up over this whole thing. But I’m looking forward to see how it works out in the end and how I’m going to choose to spend more of my time after all.. the future will tell! Also I really like my new weird name. Teiranae. 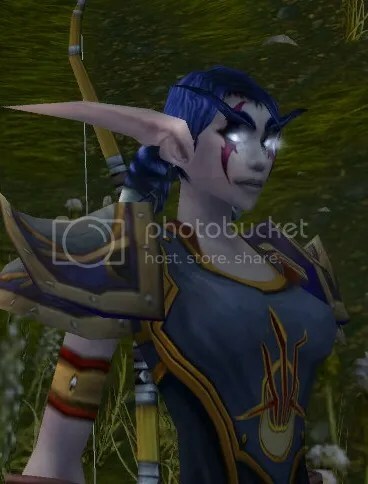 This entry was posted on Wednesday, August 14th, 2013 at 23:25	and tagged with Hunter, Levelling, mage, Pandaria, Race change, Roleplaying, world of warcraft, WoW and posted in Stuff, World of Warcraft. You can follow any responses to this entry through the RSS 2.0 feed. « Screenshot Time: ALL the Shinies! This reminds me of the first time I started playing WoW haha ^^ it`s lovely to look back to. How I started off with a Night Elf Priest and decided to level skills in all three skill trees at once because I had no idea what I was doing xD and everything was so huge, there was so much to explore! I miss WoW a bit… ._. Aye that`s true, it was lovely to suddenly realise you were doing everything wrong and re-doing it all haha. 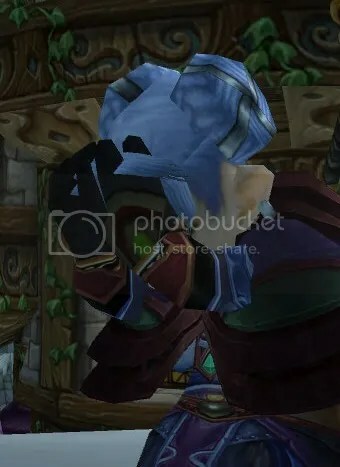 I remember a friend of mine killed mobs in the starting area for hours because he saw the inkeeper was selling a dagger he wanted to have hahaha. After he had done that he did a quest and got a better weapon hahaha.